Is THIS the Week When the Sky Falls? Roughly one month ago, after an historic lift off post BREXIT, stocks had become overbought which is a technical term for a little too far too fast. Most pundits in the media were calling for a pullback before they would buy. As I have discussed for longer than I have been writing this blog, the masses seldom get what they want or predict. When stocks bottom, the first rally is usually very powerful as it catches the majority off guard. From there, the next period is usually very telling of what happens over the intermediate-term. If the bears get going and make progress, the next few weeks to months are neutral at best. However, if the bulls can keep powering ahead without ceding much downside, it typically leads to more upside. Since this latest rally began, and really since February, I have said that any and all weakness should be used as a buying opportunity until proven otherwise. 1-3% are your typical pullbacks during bouts of unusual strength. With stocks coiling up for several weeks, I warned that a fakeout to the downside followed by an immediate move to the upside would be one scenario to watch for. That’s exactly what happened for all of the major indices except the Dow. Stocks start a new week overbought yet again but with few cracks in the pavement. I have discussed leadership rotation before and we are definitely seeing what I wanted to see for the march to Dow 20,000. Defensive groups are ceding to offensive groups. Even the “long forgotten by me” banks have exploded higher and are threatening to actually lead. That’s something I certainly did not see coming. Let’s see if the transports can also step up to help semis, software, materials and discretionary. And don’t forget about energy as a laggard play to catch up. Lots of good things continue to happen in the stock market. As long as Soros, Druckenmiller, Zell, Trump, Icahn, Cuban, Gundlach, Auth, RBS, Faber et al continue to boldly call for a worldwide financial crisis and Armageddon, pullbacks should be contained to 3% unless some exogenous hits. If you would like to be notified by email when a new post is made here, please sign up HERE. I am going to be on Fox Business’ The Intelligence Report with Trish Regan today (Friday) at 2:50 pm edt discussing my forecast for stocks and the markets, especially with the Fed set to meet next Tuesday & Wednesday. Trish is heading back from Cleveland so Ashley Webster is filling in. It has been truly amazing what a little rally has done to market sentiment. At the BREXIT bottom, as the pundits, masses and media all panicked and headed for the hills with cash, our models could not have been any more positive and stronger. I pounded the table to commit cash and resist the urge to sell. I laid out a very bullish road map which was the most positive forecast anyone could find. Even that wasn’t bullish enough! To me, there was only one path post-BREXIT; stocks were going to fresh all-time highs this quarter on the way to my longstanding target of 20,000. Thank you to the Dow and S&P 500 for cooperating already. Look for the S&P 400 to follow shortly. Today, after a very broad-based and historic rally, the pundits and masses are suddenly positive and looking to buy. The clown parade is full of clowns! Leadership has most definitely changed from the purely defensive camp to more offensive with more changes on the way. And high yield (junk) bonds continue to lead and exhibit strength. This is one fun market. As we all know though, trees don’t grow to the sky and stocks will likely pause to digest or even pullback a few percent here and there. I do not believe the stock market will see any significant downside here. It looks like weakness should be limited to the low single digits on a percentage basis at most. Could we see 4-5% down? Sure. However, there are so many investors waiting to buy that dips are likely to be shallow and bought fairly quickly until proven otherwise. Finally, I want to thank FOX61 in CT for accepting my suggestion to do a BREXIT segment on the local news. I thought it was really well done and focused on the mom & pop investor. Here is the link. And NOW They Want to Buy? Although fresh all-time highs are making headlines, making it seem like there’s a lot of action, the past week has been fairly quiet for stocks. On the surface, it looks like the first leg of the post-BREXIT rally has ended. However before you think about turning negative, I remain very positive on the intermediate and long-term. It’s the short-term that looks like a pullback or coin flip as sentiment has become a little too giddy and the pundits have all come full circle to power of the bull. That initial move off the BREXIT low when the masses were panicking and I was pounding the table to buy created some historic thrust readings which typically indicate more strength and higher prices for a while. As I have said since the market bottomed in February, weakness should be used as a buying opportunity until proven otherwise. With so many investors caught off guard by the melt up, pullbacks are likely to be shallow for a while. That doesn’t mean stocks will continue to soar in the short-term. I can certainly see a scenario where 1-3% bouts of weakness are the floor with 1-3% rallies as the ceiling for now. Sector leadership is also changing dramatically. The defensive leaders in REITs, telecom, staples, metals and utilities are beginning to cede to semis, software, retail, builders, healthcare, industrials, etc. That’s very healthy even though banks and financials remain absent. And let’s not forget the continued importance of high yield bond leadership and credit spreads narrowing. I read a stat last night that said only 1% of Americans hold off taking social security until 70. That low number really surprised me as it means 99% of Americans do not get the maximum amount of social security. When I meet with clients and prospects, one of the foundation conversations is when to take social security and why. If you are approaching retirement or already take social security, do yourself a favor and spend some time researching this! Back to the markets, stocks have run harder and faster than even I thought. And that’s saying something! Of course, the revisionist pundits have been out in force changing their tune from selling after the BREXIT vote to knowing it was the time to buy. I call this the clown parade. One thing is clear from reading this blog; not only did I stay firmly in the bullish camp, but our models gave reinforcing buy signals at the bottom. MUCH better to be lucky than good! The major stock indices are extended and could use either a pullback or pause to refresh, but momentum has been very strong. Some would call it historic and I could not easily disagree. Strength begets strength until it doesn’t. Since the BREXIT bottom, small caps and technology have led with mid caps following closely. The Dow and S&P 500 are trailing which is very bullish over the intermediate-term as it shows investors taking on risk. We now have the Dow and S&P 500 at all-time highs, but the S&P 400, Russell 2000 and NASDAQ 100 still have some work to do. Like a broken record, until proven otherwise, weakness remains a buying opportunity. On the sector front, semis, software, telecom, internet, discretionary, industrials, healthcare, homebuilders, REITs, staples, utilities and precious metals all are behaving very well. While I mentioned that the more defensive sectors might be under pressure after the stronger than expected jobs report, they have held up well as the more aggressive groups have come on strong. There is no debating that this rally has been very broad-based. Junk bonds have also reengaged in leadership at the same time as treasury bonds are finally pulling back. Long-time readers know how much stock I put in junk bond performance. I am not quite sure what to make of the treasury bond rally rally and decline. It’s not your typical “risk off” or risk avoidance trade. With the short-term volatility over the past few weeks, this is no clear trend to take advantage of post today’s employment report. By that, I mean, our short-term trading system specifically created for this report has no strong edge. The report came in strong and pre-market indications are for a higher open which can sometimes point towards a short-term peak. With the much better than expected report, the recent market leaders may be under pressure. Utilities, staples, REITs, telecom and precious metals all should be watched closely. Random things of interest. Amazing how the collapsing British Pound was the supposed cause for the the markets hitting the BREXIT skids. However, the pound has been down the last 6 days with stocks rallying. Media and pundits wrong as usual. Crude oil seems to have put in an intermediate-term peak and may be transitioning from a trading range to decline. That’s important to watch and see how stocks react to that. High yield bonds are hitting new highs for 2016 which is anything but bearish for stocks. Greetings from 34,000 feet as I head to CO for the weekend with my wife and some friends. Of course, they’re all her friends because who would really want to hang out with me?!?! As is typical when I take a day or two off, Mother Nature thumbed her nose at me with a forecast of rain, rain and thunderstorms with highs in the low 60s and lows in the upper 30s. Thanks! We may have set a record for sentiment shift in a single week. Just one week ago after the Brits said adios to the EU, at least for now, and the global markets collapsed, the talking heads all “knew” this would happen. I saw forecasts of 10%, 15% and even 20% in the downside. By Wednesday, they all said they called the bottom. What a bunch of clowns. It is interesting to note that the very well-respected Lowry’s and Jim Stack who had been bearish for over a year used the two-day decline and two-day rally as cover to turn positive. Subscribers pay an awful lot of money for those services and I would have given them better advice for free right here! It’s been a powerful three days for global stock markets and while today is starting out okay, I would be very surprised if we powered ahead after lunch with the long weekend looming. The bulls did a remarkable job into month and quarter-end which made me very happy, but I am not putting on my rose colored glasses just yet. Yes, I am still bullish over the intermediate and long-term. I think we will see all-time highs this quarter. However, I would not be shocked for stocks to pause sooner than later to digest and calm down a bit as most of the major indices approach the levels seen just before the vote. Nothing dramatic. Just a little pullback. While I have been long and positive on most of the defensive sectors for months and they have been leaving, I would still like to see some of the more aggressive groups step up. I saw a fairly compelling study last week regarding the semis and it would be really nice to see them lead over the summer. 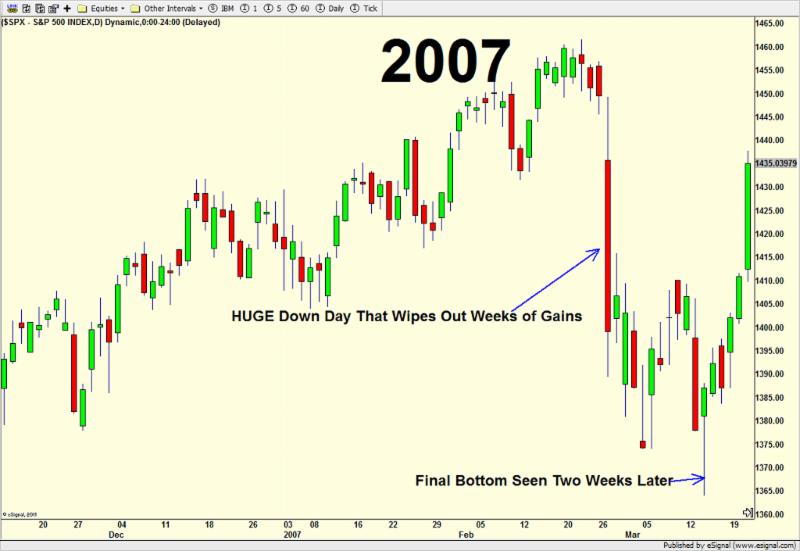 The NASDAQ 100 has been lagging and that could really create some enthusiasm and excitement. Healthcare is quietly making a move that few are noticing while my aforementioned telecom, REITs, staples and utilities all seem a little extended here. On the questionable side, I still don’t know what to make of banks and financials. Materials and transports are lagging for sure. The pilot just said to get ready for landing so I am cutting it off here. Wishing you a very fun and safe July 4th holiday with lots of good weather! Thanks to everyone who tuned in for my BREXIT segment on FOX61 in CT yesterday. You view it HERE. A few days post BREXIT and all seems well in the financial world. Listening to the business channels, everyone called the top and now everyone called the bottom. Isn’t revisionist history wonderful! Until proven wrong, I will keep referring to the Playbook I first outlined last Friday for a clue as to where stocks go from here. So far so good. On Monday, I shared what history said about big down days on a Friday. They led to more selling of 1-3% on Monday before a possible reversal was seen on Tuesday or Wednesday. At the close on Monday, one of our stock market models gave a fresh indication to buy the major stock indices which frankly, came a little earlier than I thought. Just like clockwork, the famed “Turnaround Tuesday” was like a layup as the bulls stepped up in a huge way, regaining most of what was lost on Monday. Just like that the market went from 90% of the volume on the downside to 90% on the upside. However, before we start to celebrate new highs, let’s see if stocks can recoup their losses from last Friday, something I think they will have a tougher time doing right here. The odds favor this rally running out of steam first. Over the intermediate-term, not a single thing has changed from my positive and bullish point of view. Stocks should head higher to a some type of Q3 peak. While bonds melted up on Friday and Monday as stocks fell hard, bonds still managed to rally on Tuesday. Semis have been hit very hard and need some time to regain leadership as their previous rally suggested. Banks and materials look crummy. The same defensive groups, utilities, staples, REITs and telecom remain strong as does the precious metals sector. After Friday’s big down day which historically has occurred less than 1% of the time, the model for Monday is another large red day of 1-3%. From there, stocks should attempt to form a low on Tuesday or Wednesday and rally for a few days to a week. This is right in line with the Playbook I offered here on Friday. As you would expect, the financial sector has been hit the hardest, but I am a little surprised that technology has been so weak. Semis, specifically, saw new highs last Thursday and are now down 10% in two days. What has been leading, remains leading, namely defensive sectors like REITs, staples, utilities and precious metals. Long-term treasury bonds have exploded higher, sending yields close to all-time lows. That’s definitely a plus for the mortgage market! Investors all over the country are wondering what to do now. While trying not to sound flippant, if people weren’t nimble enough to take action before the vote, personally, I wouldn’t overreact emotionally like investors usually do during major geopolitical events. We are in a period of short-term pain, but that should not dictate the long-term plan for gain. What I found amazing from my weekend reading was how many pundits were now calling for recession within 9 months because of the vote. My head is still shaking, especially when it comes to the U.S. While we are long overdue for a mild recession, I absolutely do not believe it will be caused by the BREXIT vote. Good for the citizens of the UK! In true democratic form, the majority were unhappy and voted for change. And that’s what they got. Kinda, sorta. If I had the power to vote, I guess I would have voted to leave because I would rather be the first one out than the last. The pundits were embarrassed. The markets got it wrong. The bookmakers appear to have lost a fortune. In my piece earlier this week, http://investfortomorrowblog.com/archives/2292, on Twitter and Facebook, I quoted the late Joe Granville whom I learned lots from in the 1980s. “If it’s obvious, it’s obviously wrong!” Joe is smiling and laughing today as he looks down from heaven. The markets weren’t worrying about the vote which was worrying to me as I wrote. As stocks around the globe rallied sharply over the past week, I figured that the UK would vote to remain in the EU and then we would see a sell off on the news. Buy the rumor, sell the news. We are only getting the sell part this morning although the Dow is simply back to the level we saw just one week ago. Let’s get one important forecast out of the way right here. I remain firm that the bull market in stocks is not over. 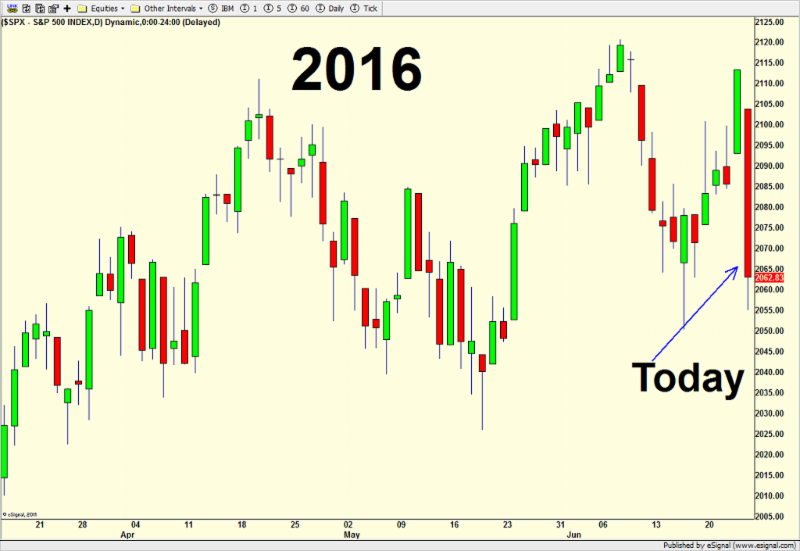 The bull market remains alive and all-time highs are on the way this year. As you know, I love looking for comparable periods to current market action. While I admit to not to spending more than 5 minutes thinking about this today, February 2007 immediately came to mind when we first heard of potential woes in China. Look at the chart below on the far right side to see what I mean compared to 2016 just below that. 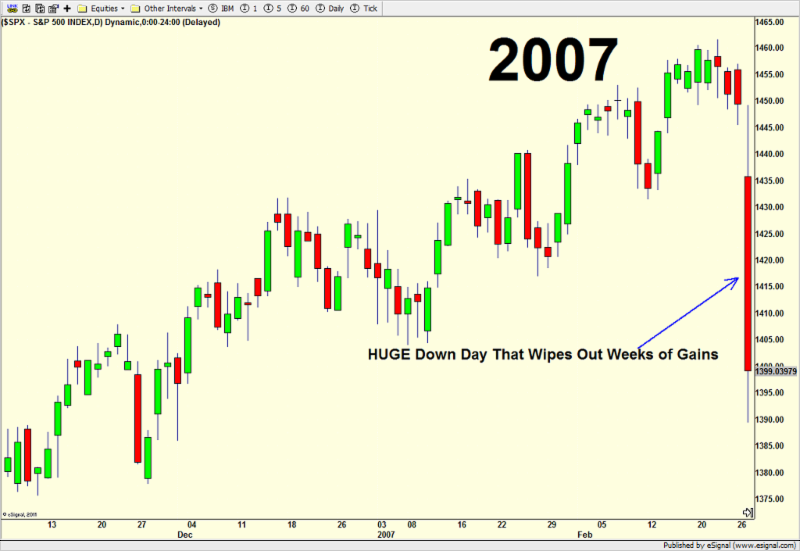 The huge down day in February 2007 wasn’t THE low, however it was where the vast majority of damage was done. Two weeks later after some choppiness and digestion, stocks made their final low, as I was sitting on top of a ski mountain in Utah celebrating my 40th birthday while doing a TV interview. Finally, less than two months after the huge down day, the major stock market indices saw fresh all-time highs. 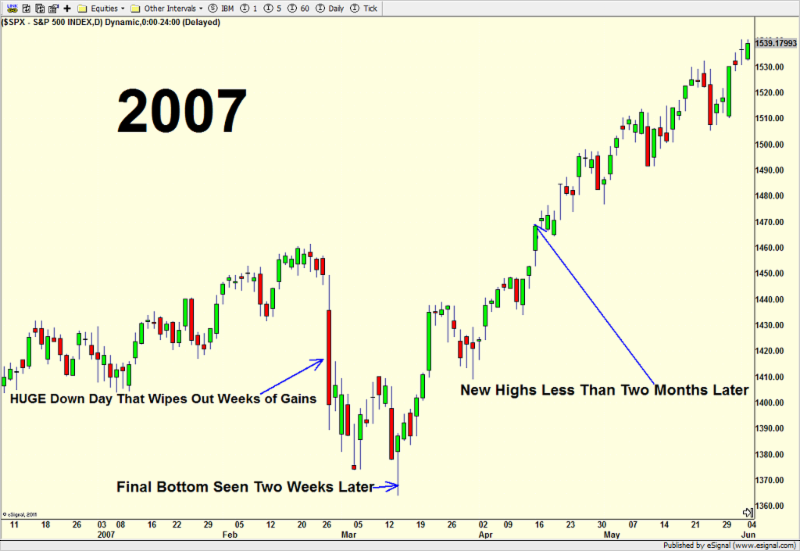 I believe a similar path is on tap today with my familiar call for Dow 20,000 not far behind. Why is Everyone Freaking Out? That’s a good question! First, the UK Leaving the EU doesn’t mean much economically, fiscally or politically. Some are concerned that Scotland and/or Northern Ireland will be next. I think that’s valid and there will be at least one vote for independence. The huge concern is that now the UK is supposedly leaving, it will make it easier for the Netherlands, Denmark, France, etc. to hold their own votes to leave. In other words, the dominoes will begin to fall and fall hard and jeopardize the whole EU and euro currency. Those are valid concerns and a forecast I first wrote about more than 10 years ago when I saw how flawed the euro was. Keep in mind that this one high profile vote in the UK yesterday is not binding and may not be over. Parliament must vote and the UK and EU then have at least two years to negotiate terms of the exit. I hope no one thinks it’s going to be an easy negotiation. During that time, don’t be surprised if the powers that be in the UK hold another referendum to overturn this one. It’s that fluid and crazy! Finally, last night’s vote puts another nail in the coffin of German Chancellor Merkel as she stands for reelection in 2017. Once the most popular and respected politician in this history of Germany, her stance on immigration has turned her into public enemy number one. Should Merkel lose, the euro currency and EU would lose their most vociferous supporter. If you would like to discuss how this will impact your portfolio for anything more than the short-term, please reply or call the office to schedule a meeting. Lots of opportunities being created! BREXIT, SCHMEXIT – Much Ado About Nothing??? Like Y2K, the second war in Iraq and other date certain events, the United Kingdom will vote on Thursday whether it wants to remain in the European Union (EU), otherwise known as BREXIT (BRitain EXIT). Unlike most geopolitical events which just happen, the BREXIT vote has been known about for some time as UK Prime Minister Cameron promised to hold this referendum if he won reelection in 2015. Depending on who you ask, the reasons for staying or leaving are all over the place. However, I would speculate that less than half the people voting actually understand what they are voting for or against. And those with very strong convictions are the ones who probably have an axe to grind. Personally, I don’t care what the British people decide. It’s their country and they should do whatever they want. I just laugh when people like Hillary Clinton, Barack Obama, Warren Buffet, Jamie Dimon and other Americans make these forceful arguments for staying. Or those like Donald Trump and Paul Ryan on the other side. When politicians and others from other nations opine on our affairs, we tell them to mind their own business. We should take our own advice and shut up. Anyway, over the years, I have written about the flaws with the EU and euro currency. Flaws that some day would need to be addressed. It’s the “haves” and the “have nots”. Unlike the U.S. where the playing field among states is generally level, it is definitely not in Europe, especially on the fiscal front as we have seen over the past 7 years. If the EU and euro are to remain viable long-term, they have a lot of work to do. Getting back to the BREXIT vote, nationalistic political parties throughout Europe have been surging as a result of the terrorist attacks and immigrant crisis and the UK is no different. Each side of the vote cites immigration as one reason to stay or leave with either closing the borders again or leaving them open. Cost of EU membership is another black/white issue. In 2015, the UK paid north of $18 billion to be part of the EU and some argue that they received a fraction back in revenue. Trade is another huge issue as all EU members’ agreement are in accordance with EU law. Some argue that leaving the EU will allow the UK to renegotiate better deals while others don’t think it will get any better. Those in favor of exiting also cite loss of sovereignty as a reason to leave. They want the UK to make their own laws and regulations without having to answer to a high power. The bottom line is that both sides are equally right to some extent. BREXIT has been a financial media obsession for months. More recently,it seems like any and every time stocks pull back, the media has “Breaking News” about the markets collapsing on an outcome to leave. Yet the few large rallies are attributed to opinion polls swinging back the other way. In the internet age, polls have definitely lost some of the value from the good ole telephone calls. We saw that really happen during the early primaries. I would put much more stake in how the bookmakers are viewing the vote as there is real money on the line. Does a BREXIT really matter? If this was a one shot deal for one country, I don’t think it would matter at all. The problem is that it could have a domino effect around Europe as well as in the UK itself. If the UK votes to leave, it very well could bring up the issue of Scottish independence yet again, not to mention the potential for Northern Ireland to leave the UK. And those pale in comparison to potential exits by Greece, Portugal, Italy, Spain and France, in which case, the whole EU and euro begin to implode. Let’s say there is a BREXIT. It doesn’t happen overnight. Rather, the EU and UK spend AT LEAST the next two years negotiating agreements on how an exit would take place. If the exit terms are too onerous or UK citizens have a change of heart, the UK could hold yet another referendum to overturn the one on the 23rd. Nothing is absolutely certain after this vote. Global markets have been fairly calm and some would argue, complacent, about the vote. There doesn’t seem to be a high degree of stress in the system. I think the central banks and financial powers around the world have learned their lessons from previous missteps. There is an ocean of liquidity in the system now and my sense is that bankers are not going to let that change this month. The doom and gloom has been very vocal lately with that quack, George Soros, forecasting a global meltdown and calamity on a vote to leave. He is not alone in “selling his book”. Markets have been on the comfortable side which puts me on guard for at least a short-term bout of weakness regardless of the outcome. As I have stated hundreds of times over the years, I don’t care as much about what the news actually is as much as I do about how the markets react. last week, my thought process has been to go opposite whatever the markets did into the vote. If they rallied strongly, I thought we would see a decline after the vote. If they sold off into the vote, I thought they would bottom next week. Unfortunately, they haven’t done much on balance over the past week with a decline and then rally right back. Perhaps the best move right now is no move. Regardless of the BREXIT vote, the naysaying pundits and doom and gloom crowd will get back to worrying about Donald Trump, the Fed, poor earnings, negative interest rates in Europe, China and the employment data before long. My investing theme remains unchanged. Until proven otherwise, weakness is a buying opportunity and new highs will be seen this year with Dow 20,000 on the way. The bull market ain’t over!